Catalonia’s parliament has declared independence from Spain. The declaration is in defiance of the government in Madrid which, at the same time, was preparing to impose direct rule over the region. 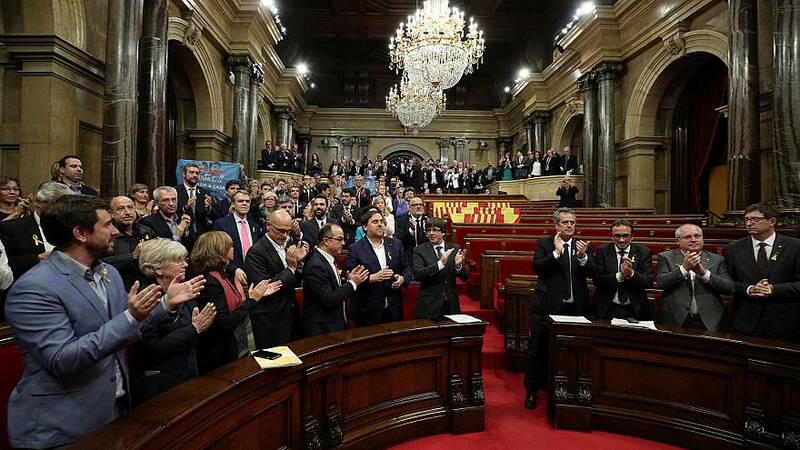 The motion – passed in the regional parliament in Barcelona and boycotted by opposition parties – said Catalonia constituted an independent sovereign and social democratic state. It called on other countries and institutions to recognise it. It also said officials want to open talks with Madrid to collaborate on setting up the new republic. In Barcelona, crowds of independence supporters swelled onto the streets of the city, shouting “Liberty” in the Catalan language and singing traditional Catalan songs. Although the declaration was, in effect, a symbolic gesture as it will not be accepted by Spain or the international community, the moves by both sides take Spain’s worst political crisis in four decades to a new level. After the debate, lawmakers from members of three main national parties – the People’s Party, the Socialists and Ciudadanos – walked out. Members of the pro-independence parties and the far-left Podemos then voted by 70-10 in favour in a secret ballot aimed at hindering any attempt by the central government to lay criminal charges on them. Prime Minister Mariano Rajoy immediately called for calm and said the rule of law would be restored. The Senate – the upper house of Spain’s Senate – has approved Article 155 of the constitution. This is the law that allows the central government to take over the autonomous region. Rajoy is expected to convene his cabinet to adopt the first measures to govern Catalonia directly. This could include sacking the Barcelona government and assuming direct supervision of the Catalan police force. But how direct rule would work on the ground – including the reaction of civil servants and the police – is uncertain. Some independence supporters have promised to mount a campaign of civil disobedience, which could lead to direct confrontation with the security forces. Because of an independence referendum on October 1. Madrid declared it illegal. Although the vote backed independence, it drew only a 43 percent turnout. Catalans who oppose independence largely boycotted it. “Exceptional measures should only be adopted when no other remedy is possible. In my opinion, there is no alternative. The only thing that can be done and should be done is to accept and comply with the law,” – Spanish Prime Minister Mariano Rajoy said in an address to the Senate in Madrid.